In 1785, the Charles River Bridge Company was granted a charter by the Commonwealth of Massachusetts. 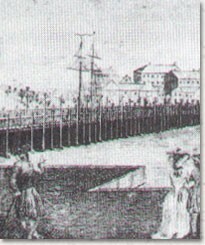 The charter allowed the company to construct and operate a toll bridge between Boston and Cambridge. In 1828, a second bridge company received a charter to construct a link across the Charles River. This bridge would become free to the public within six years. The Charles River Bridge Company, which received the original charter, sued. The company argued that the charter gave them a monopoly on the Charles River. The case began at the highest court of Massachusetts and then moved on to the Supreme Court of the United States. In 1831, the case was presents to Chief Justice John Marshall, who would have ruled in favor of the Charles River Bridge Company, but due to absences and disagreements, it was not possible to come to a decision at the time. In 1837, a decision was finally made, but with a new Chief Justice, Roger B. Taney. He ruled that the Charles River Company did not contain the monopoly and that the second bridge would be constructed due to general welfare. The Charles River Bridge vs Warren Bridge court case was one of the first court cases that constituted as proof for contradiction of the Constitution's contract clause. The case also contradicted a pervious ruling by John Marshall in support of the Dartmouth College keeping their charter, Although, the government made it clear that the states could not oversee charters, this case did spark a debate over the protection of charters in the future. "Charles River Bridge v. Warren Bridge." Charles River Bridge v. Warren Bridge. N.p., n.d. Web. 09 Nov. 2014. <http://www.u-s-history.com/pages/h348.html>.